It’s Sunday morning and I’ve got my cup of coffee + some Sufjan Stevens playing. I am so happy to be connecting with you right now. You are someone who is a kindred spirit. You’re here because you care about making the most of life. You care about learning to love better, more deeply, and more openly. You are someone who truly gets it that it is a miracle that we are here on this planet. And that our time here is fleeting. You, just like me, are practicing what it is to live a life that is filled with more appreciation, celebration, and joy. What I am so grateful for is that we get to practice TOGETHER. I am inspired to delve deeper into all of these practices because I have you here, with me, sharing the ups and downs of the journey. In a couple weeks my book, “Say it Now: 33 Creative Ways to Say I Love You to the Most Important People in Your Life” launches. It’s a very significant moment for me. Many of you know that thirty years ago, when I was a young adult, I was filled with anxiety and depression. I didn’t think I was meant to be on this planet. I felt as if I would never live up to the expectations for who and how I should be. On the outside, people saw someone who looked bright and bubbly. But on the inside, I was scared and full of self-loathing. All I could see was the hoops I wasn’t able to jump through — how I wasn’t successful or motivated or grounded. How I was so insecure that when I was in conversations with people, I turned chameleon. I nodded in agreement to everything because I didn’t think my own opinions were valid or valuable. It was so painful that all I thought about was how to get out. How to get out of this body and off this planet. I never imagined I could live a different kind of life. Then grace happened. Meditation happened. Pinpricks of light in that iron wall of pain happened. And moment by moment by moment by moment, I practiced looking for and creating light. My whole life is different now. My days are filled with creativity, appreciation, connection, spontaneity, and joy. I feel so much love for that young girl who thought she was a mistake. And I feel so much love for anyone who is in the dark — whether it is the fearful iron wall closing in like mine was … or whether it is the feeling of flatness and apathy … or whether it is simply discontent or disappointment, that feeling that something is missing. More than anything, I want to share what I’ve learned. I want to be the one to turn on the nightlight and tell stories of love when we’re afraid of the dark. My book, “Say it Now,” can be that nightlight. I know it. Because I’ve lived it. This book is full of the stories of the journey I’ve been on and the creative ideas that Life has given me to share pinpricks of love. This book is my way of saying, come with me! Let’s go farther than we ever thought possible into a life of celebration, love, and joy. Will you come with me right now? Will you join me in a deeper look at putting love into action and understanding in our cells that when we do so, we are forever changed? Say it Now is on Sale! Your purchase right now is an incredible boost for my work. It isn’t just the book purchase. (Which means so much!!) What happens is that every pre-order changes the Amazon algorithm and sets the book up for greater promotion from Amazon once it launches. I said this in a previous email, but it is still so true: your support right now is like having fairy godmothers bless the book. It creates a foundation for the book that is all love. 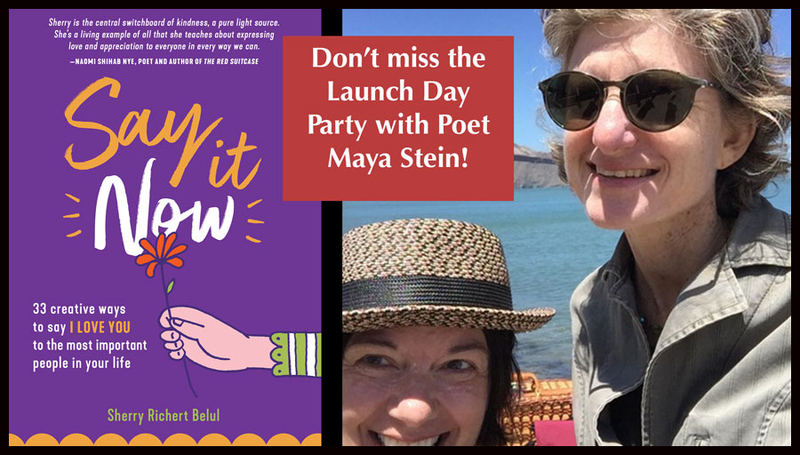 Because these pre-orders are so important to me, I’ve created some bonus gifts for you: a mini-workshop walking you through creating amazing Mother’s Day gifts, my Celebration Bookmaking course, and a Launch Day Party with myself and poet Maya Stein. This party is virtual, so you can join from wherever you are, simply by calling in. During the Launch Day Party, we’ll be walking you through creating a knock-their-socks-off Love List for your mom, for a mom in your life, for someone who had played a nurturing role in your life, or for anyone you want to gift on Mother’s Day. What’s a Love List?? Why, it is simply a list of all the reasons you love somebody! Love Lists are sweet and funny and silly and sassy and oh-so-connecting. Love Lists are one of the easiest ways to connect with someone you love. There are so many ways to present them — on paper, in a Joy Jar, as fortune cookies, as mobiles, in flower bouquets, via audio or video, etc. It is a simple idea with a profound impact. It will change your life. I’ve created dozens, if not hundreds, of Love Lists in my life. Hands-down this has been one of the most powerful practices of my life. I want you to join Maya and me. I want you to laugh with us and celebrate. I want you to create a ready-made gift of love that you can send to someone for Mother’s Day. The Launch Party is not just a bonus. It isn’t just a thank you for your support for buying the book. It is a way that we get to be together in community + create more light for the world. If my work has inspired you, if you have followed along for years or weeks or days, if you believe in the power of creating magical moments, please support me by pre-ordering the book. Your $10.39 will go far in helping me to continue to share this work. I have a dream of inspiring 1,000,000 Love Lists. I want 1,000,000 people to have the chance to know why they are so lovable, what makes them unique, and the impact they’ve had on people. Once you order your book, visit this page to redeem your bonus gifts and to get registered for the Launch Day Party! I can’t wait to celebrate with you!!! Deepest gratitude for being on this journey with me. It would be so lonely without you!